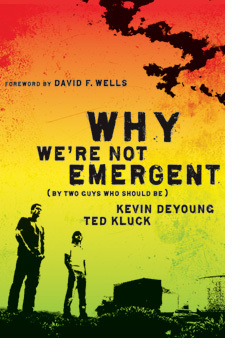 Why We’re Not Emergent (By Two Guys Who Should Be), Kevin DeYoung and Ted Kluck, Moody Publishers (2008), 256 pages, $14.99. The emerging church is a complicated movement that is particularly relevant for younger people like you and me. You have probably all heard of the hipster preacher Rob Bell. Well, he is only one spoke in a larger movement across the United States as well as in Europe. What is this movement? The emerging church is essentially a sort of synthesis of Christianity and post-modernism. But of course, identifying the emerging movement with post-modernism makes the water muddier. As DeYoung puts it, “Defining the emerging church is like nailing Jell-O to the wall” (16-17). Nevertheless, Why We’re Not Emergent does a pretty good job of encapsulating the general beliefs, practices, and feel of the emerging church. It is extremely important that we be aware of this movement. It is an attack of the devil which is particularly directed at younger people. Perhaps our own Protestant Reformed young people will not be so easily swayed by the teachings of the emergent church, but do not underestimate the appeal of its message. The god of the emergent church, who claims that he will save everyone head for head, is a false god. Such a god is not the God of Scripture but is a modern Baal. It is a god which appeals to human flesh. It is a god who makes it possible for me to be friends with the world. The authors of Why We’re Not Emergent do a good job explaining the movement of the emerging church in detail in addition to offering good biblical criticism. Kevin DeYoung, a Reformed minister from Lansing, MI evaluates the movement in the light of Scripture. The only criticism I have of DeYoung is that his criticism of the emergent church isn’t quite critical enough. I will let you be the judge when you read the book yourself. Ted Kluck is a sportswriter who is a member at DeYoung’s church in Lansing. He gives a grounds-eye perspective of the movement, relying less on research and more on sarcasm and wit to make his points. Together, DeYoung and Kluck give a comprehensive picture which is not only informative but also enjoyable to read.